I am enclosing a picture of a boat which I built from a "Miss Mist" boat plan which I bought from you in April 1999. There has been a lot of work with this project, and I would like to thank every one at Glen-L for their friendliness and the expert advice I received from members of your staff when I called with questions or problems that had arisen. I would highly recommend that anyone who is interested in building a boat to contact Glen-L and work with them on such a project. The enclosed picture was taken when the boat was put in the water for the first time. 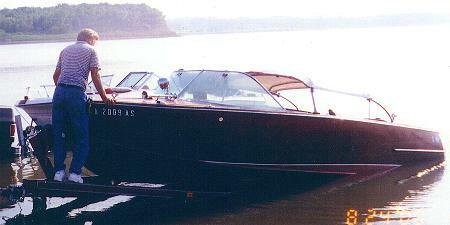 The boat is powered by a 1959 Gray Marine AMC Fireball V-8 327 cubic inch motor. We are very proud of the way it turned out and thank you again for all your assistance in the project.